A compact, lightweight, portable pressure standard with 0.25% accuracy gauges, the DWT1327D Test Set is ideally suited to field testing or remote in-plant applications. The test set consists of a two-stage hydraulic pump and a manifold which is pressurized during operation. An integral part of the pump is a new shuttle valve feature that can increase the speed of pressure build-up or reduce the effort necessary to operate the pump handle. 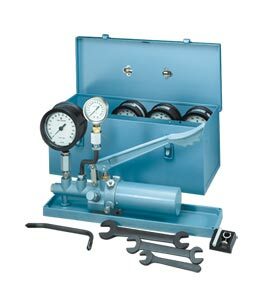 One connection to the manifold is for a 4½" PGT-45L solid front test gauge (0.25% gauge span accuracy); the other connection accommodates most standard size dial gauges.